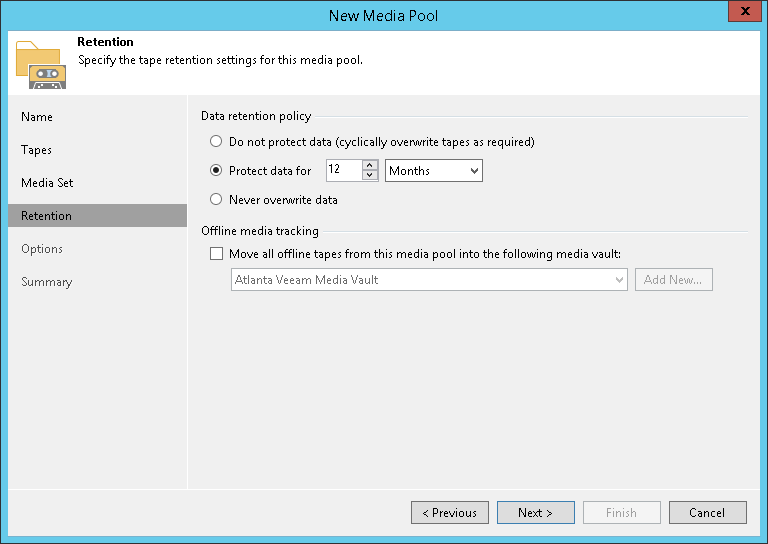 At the Retention step of the wizard, specify the retention settings and offline media tracking options for the tapes in this media pool. For details, see Tape Data Retention. For WORM media pools, retention option is inapplicable; retention settings are inactive. Never overwrite data. If this option is selected, data on tapes will not be overwritten. If there is not enough tape capacity for the archiving job to complete, Veeam Backup & Replication will pause the job and prompt the backup administrator to add new tapes to the media pool. In the Offline media tracking section, you can set automatic moving tapes to a media vault when they are brought offline. For details on vaults, see Media Vaults. From the Vault list, select the media vault where you want to automatically move the tapes. If the vault is not added yet, click Add New to open the New Media Vault wizard.